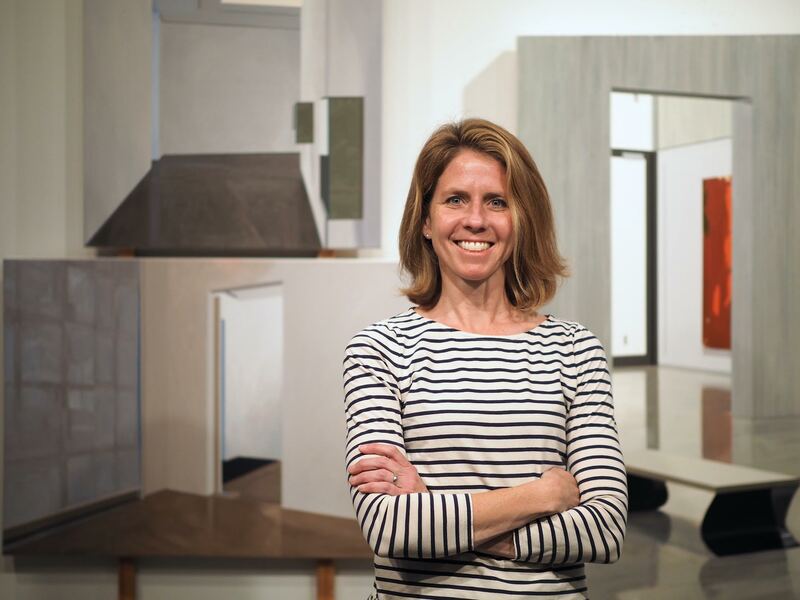 Painter Sarah McKenzie, whose current exhibition in Indianapolis features 11 new paintings and 2 recent prints, has an interest in the architecture and ambience of exhibition spaces. 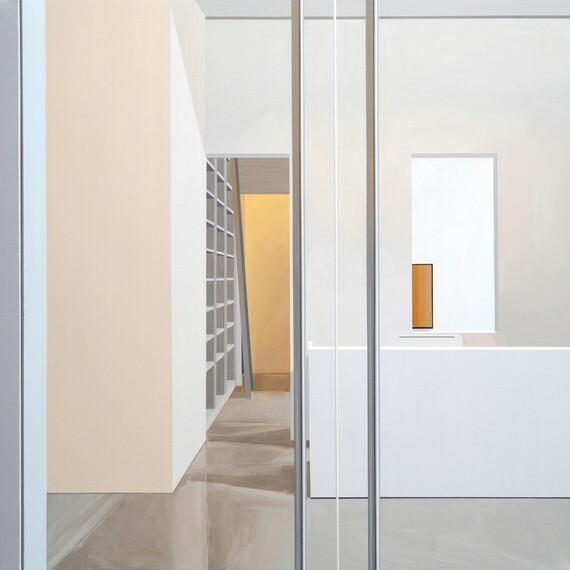 In her clear, thoughtfully structured compositions, works of art and mundane elements work in concert within their carefully constructed settings to generate aesthetic conversations. The works depict exhibition spaces as serene, contemplative spaces where thoughts and objects meet. I recently interviewed Sarah to learn more about her ideas and themes. 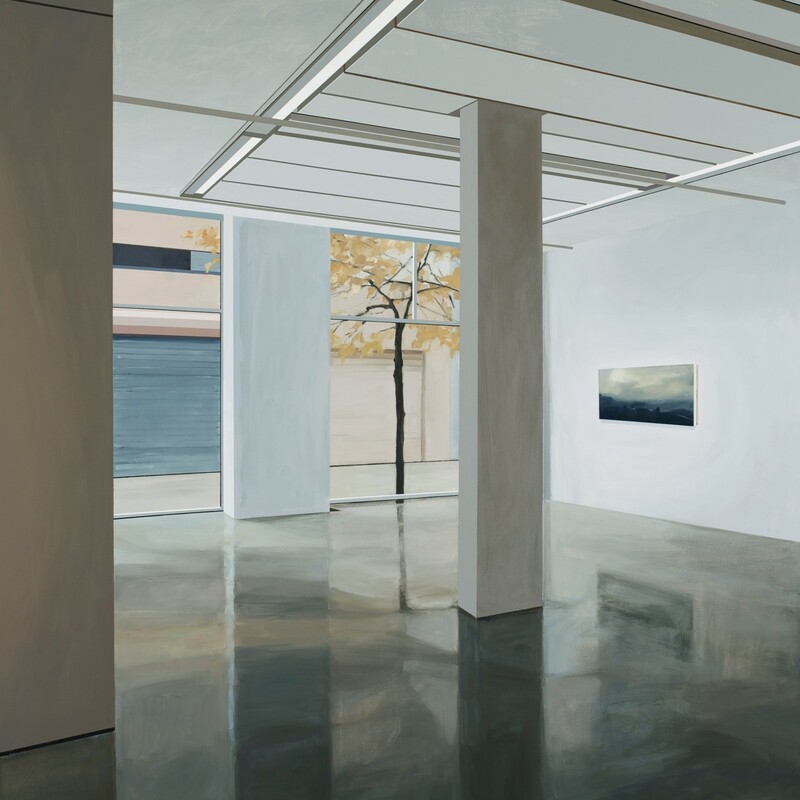 How did you become interested in painting exhibition spaces? I've been painting architecture for about twenty-five years now, and I've always been interested in exploring the ways that buildings change with time. Over the years, this has led me to paint abandoned homes and vacant factories, as well as construction sites and brand new subdivisions. Around 2011, I started thinking more about architectural spaces that are designed to be transitional and accommodate the temporary. Initially, I was thinking about parking garages and hotel rooms... but by 2013, I started looking more at exhibition spaces. I traveled to London for the Frieze Art Fair in October of 2013, and while I was there, I shot a number of the source photographs that led to the first paintings in this series. 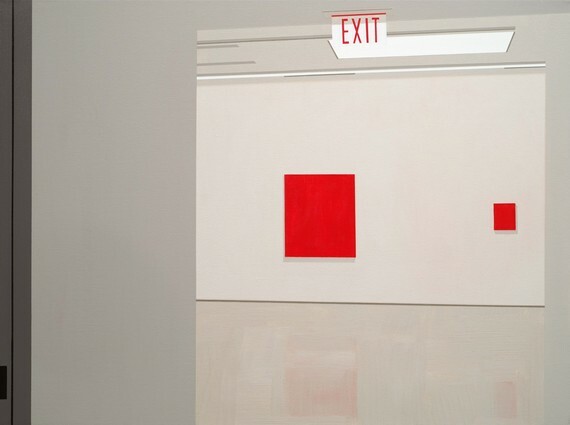 During the mid-20th century, the art world essentially perfected the minimalist, white-walled cube that has become the international standard for art exhibitions today; I am fascinated by the contradictions of that Modernist gallery space. That a room can be stripped bare but remain pregnant with cultural meaning is truly fascinating to me. When I enter a blue-chip gallery or world-class museum, it's as if all my senses other than sight recede. The space itself (along with the expectations I bring to it) sets up a hyper-visual experience that feels transcendent at times. Even the exit signs, fire extinguishers, and window coverings take on an aesthetic weight that they wouldn't have in any other type of space. Many of your paintings have paintings in them: are these choices homages, or do they reflect something else? 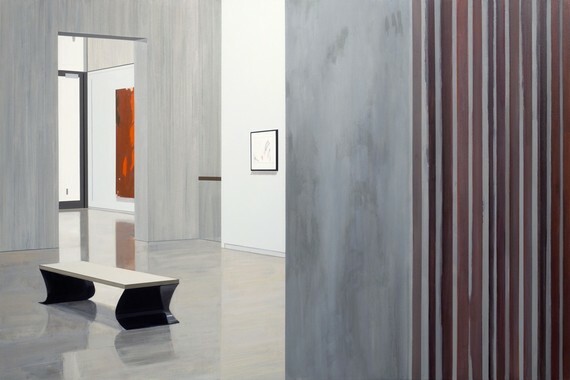 I imagine that I typically depict gallery spaces that feature paintings primarily because I am a painter. I spend a lot of time considering the relationship between the space within the frame (pictorial space) and the space beyond it (real space). 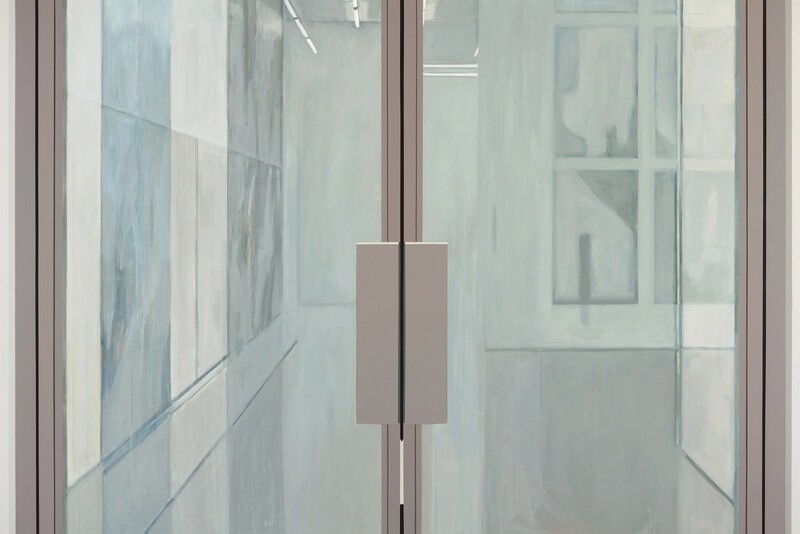 This body of work brings that relationship front-and-center, particularly in works like Door to the River (Whitney Museum with Willem de Kooning, 2015), 2016 and Landscape 1 (Danese Corey with Dozier Bell, 2014), 2015. I don't really think of these paintings as homages, though I generally like the work of the artists that appear in my paintings. My decision to paint a particular scene is inspired by the relationship of the art work to the surrounding gallery environment, rather than by a particular interest in a specific artist or artwork. What do you say to the idea that you are implying human presences without including figures? I think that's true! I want the viewer of my paintings to stand in for the implied viewer in the gallery spaces that I am presenting. In that sense, I am asking you to engage in a double-act of looking. What kinds of ideas and emotions are you trying to embody in this series? On the most basic level, I'm hoping to capture the almost spiritual quality of exhibition space, while also pushing the viewer to consider how highly-coded, constructed, and controlled these spaces actually are. I think that idea translates into very specific material terms in my work. 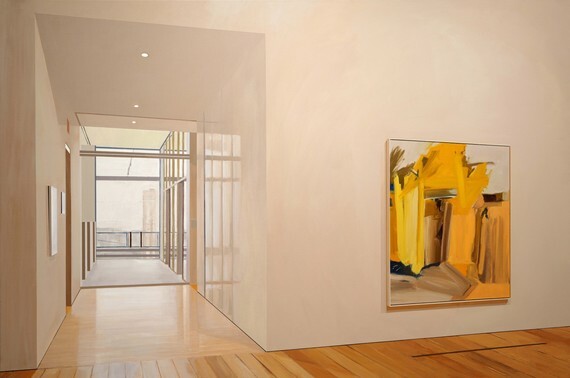 When you see my paintings in reproduction, or from across a large room, they appear almost photo-realistic at first, and the illusion of light and space is fairly convincing. As you approach a canvas more closely, however, that illusion breaks down. Many areas of my paintings are treated in a highly simplified, almost abstract manner, in contrast to more detailed and painterly sections. I work with both oil and acrylic paint, so any one canvas will contain a variety of surface textures and stylistic approaches. I am presenting a highly constructed image of a highly constructed space. Nothing is accidental. What have you learned about museums by painting them? I think I've come to appreciate just how much good curators think about the gallery space as a kind of blank canvas when designing a show. I'm certainly not the first person to consider the relationships between architecture and art works that are highlighted in my paintings. Shortly after I started this series of painting, I read Beyond the White Cube: The Ideology of the Gallery Space, by Brian O'Doherty. It's essentially a series of his essays, written in the mid-1970s, exploring the development of the modernist gallery space. I find it interesting and perhaps a bit surprising that the codes for exhibition space that prevail today have remained essentially unchanged since the 1970s. You have a busy life balancing family and career: how do you keep your paintings so serene? Honestly, these paintings are serene because the spaces I am depicting are serene. When I spend time in a museum or a great gallery, I'm not thinking about the minutiae of my daily life-- I am completely immersed in the visual experience of the art and the space. That's what I'm trying to tap into back in my studio when I make these paintings. When I was painting construction sites eight years ago, that work was much less serene, generally, because the subject demanded a more aggressive and high-intensity approach. I would also note that while I do have a busy life, it's not necessarily any busier than other artists of my generation. I think the key to remaining focused in the studio is to compartmentalize. When I step into the studio to work, I have one job to do. Well, since I live in Boulder, Colorado, it won't come as a surprise that I am an avid runner. I consider my daily run to be an essential part of my studio practice, actually. I don't run with music or any kind of audio. I use my workouts as a time to clear my head and think through whatever project is at hand. It is the one time of day when I am reliably "unplugged," and that is so very necessary for any creative person. I also love yoga, XC skiing, reading, debating politics, and watching professional soccer. If I had more time, I would cook and garden more, but those interests are on the back-burner right now. I don't own a television, but I will occasional download an entire season of a show (Girls, Game of Thrones, House of Cards, and Outlander are favorites) and binge-watch it in just a few days. I can't do that very often, or I would get nothing else done!